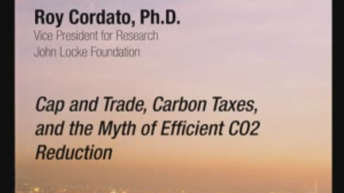 Roy Cordato is vice president for research and resident scholar at the John Locke Foundation. From 1993-2000 he served as the Lundy Professor of Business Philosophy at Campbell University in Buies Creek, North Carolina. From 1987-1993 he was senior economist at the Institute for Research on the Economics of Taxation (IRET) in Washington, DC. He has served as full-time economics faculty at the University of Hartford and at Auburn University and as adjunct faculty at Johns Hopkins University. His publications include Welfare Economics and Externalities in an Open Ended Universe (Kluwer Academic Publishers, 1992). In 2000 he received the Freedoms Foundation’s Leavey Award in Free Enterprise Education. He is also a member of the Mont Pelerin Society and former executive board member of the Association of Private Enterprise Education.